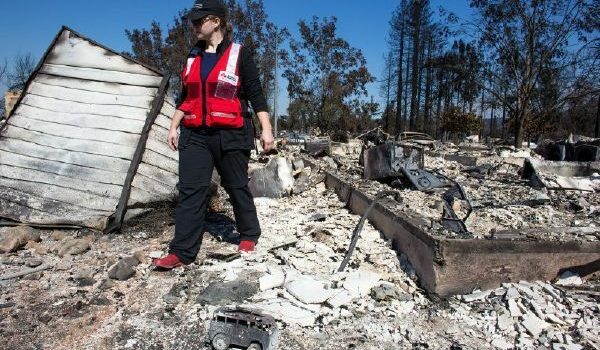 Some of the nearly 280 deployed Red Cross workers from the Los Angeles Region have made their way home from assisting with hurricane relief efforts; but, many others find themselves leaving—some redeploying, others on deployment for the first time—to a different sort of disaster relief campaign: the historic wildfires in Northern California where, as of October 16, 41 lives have been lost and as many as 5,900 structures have been destroyed. This tragedy is ongoing, situated in a pastoral region part of California known for its beautiful landscapes and genteel, viniculture lifestyle. The shocking transformation into a deadly inferno defies description. We have sheltered more people in these fires than ever before in a California fire. Why? It is harvest season for grapes and many can’t afford to leave the region. These people have been evacuated from their homes and those that still have work are seeking out shelters to get to their jobs every day. All told, so far we’ve provided more than 25,000 overnight stays in 30 Red Cross and community shelters across the state. For those who have lost homes—and there are many, many people who have lost everything—the Red Cross will continue to offer shelter and housing assistance. For those eligible for FEMA assistance, we will help connect them to help them qualify. And, for those ineligible, they will as always remain eligible for our help, because Red Cross disaster assistance is always free and available to everyone affected by disasters. None of this work would be possible without the endless dedication of volunteers like Wendy Linderholm, who served in Dallas for Hurricane Harvey and is now in Sacramento for the wildfires, or Carmela Burke, who served in South Carolina for Hurricane Irma and is in now in Santa Rosa. 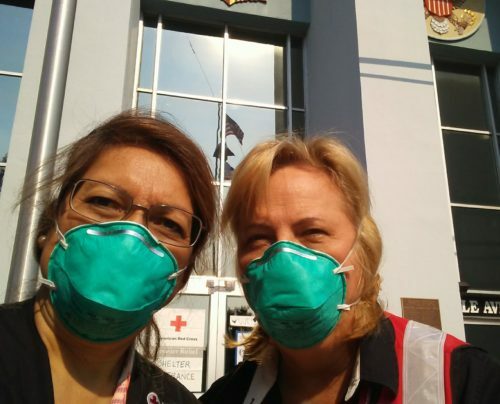 By assisting with relief efforts in Northern California, Wendy and Carmela are living our Red Cross motto: Sleeves Up, Hearts Open, All In. I couldn’t be more proud. While residents of some communities affected by the wildfires have been allowed to return home, tens of thousands of people remain under mandatory evacuation orders, and as many as 27,400 homes are still threatened by the fires. And, though the winds have died down and many red flag warnings have been lifted, firefighters are still working on containment. Already, more than 217,000 acres have burned, including thousands of residences. If losing so many lives and homes weren’t enough, businesses in the area have also been affected, potentially putting many people out of work. For neighborhoods and business in Northern California, these recent deadly wildfires will be a true test of their overall strength and resiliency as a community. It is also a wake-up call for those of us caught in the middle of wildfire season only a few hundred miles away. Here at the Red Cross in Los Angeles, and through our PrepareSoCal campaign, we work every day to ensure Southern California residents become better prepared for, safer during and more resilient after a natural disaster or emergency. Despite our efforts, it is imperative that you and your family make a plan, stay informed and above all, take the necessary steps now to become prepared. In the Los Angeles area, this means being prepared for wildfires, earthquakes and home fires, as well as floods and other disasters. Just this week, a wildfire broke out in the hills behind Pasadena, near the Mount Wilson Observatory. If thousands of homes in our backyard were threatened by deadly flames, would your family know what to do? 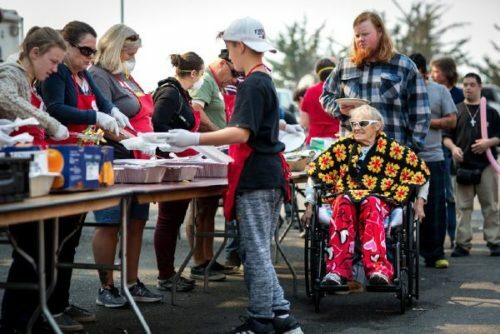 Residents receive lunch at a Red Cross shelter prepared by a partner agency, The Salvation Army. First and foremost, please follow evacuation orders from local law enforcement and always have an emergency kit ready to go. Your emergency kit should include a gallon of water per person for three days, a three day supply of non-perishable food for each person in your family, a seven day supply of medications, a flashlight, hand crank radio, first aid kit and other emergency supplies, personal hygiene items, important documents and extra cash. We have many preparedness resources available, and you can always go to preparesocal.org to learn more. You may also want to download the free Red Cross Emergency App to have real-time information at your fingertips. The Emergency App is available in app stores by searching for the American Red Cross or going to http://www.redcross.org/apps. This year alone, there have been more than 51,435 wildfires that have consumed more than 8.7 million acres across the U.S. Entire communities and families have been left with nothing. I urge you to help people affected by the California Wildfires by visiting redcross.org, calling 1- 800-RED CROSS or texting the word CAWILDFIRES to 90999 to make a $10 donation. 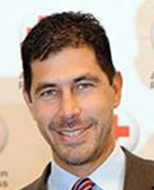 Jarrett Barrios is the Chief Executive Officer at the American Red Cross Los Angeles Region. 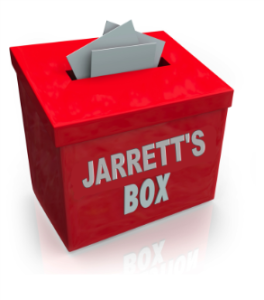 But, above all, Jarrett Barrios is a humanitarian with more than 20 years of experience helping people in need throughout the United States and Cuba. To learn more about Jarrett Barrios or the America Red Cross Los Angeles Region, visit RedCrossLA.org.